Dr. Robertshaw was born and raised on an Oxford County dairy farm near Innerkip. 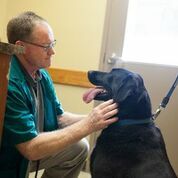 In 1978, he graduated from the Ontario Veterinary College at the University of Guelph and for the past 38 years, he has devoted his time to the health and welfare of animals and their owners in Elgin County. Dr. Robertshaw has been a business owner and partner with Dr. Russ Moncrief for 36 years and a partner with Dr. Wayne Carroll for 26 years. Most of Vern’s time is spent working on horses and small animals. Vern spends a lot of his time performing equine dentistry. Vern has the unique perspective of having many years of experience with Western medicine and also being trained in chiropractic, acupuncture and Chinese herbal veterinary medicine. He believes that these alternative therapies have given us tools to help our patients live longer, happier lives when chronic diseases such as arthritis and allergies do not respond to traditional therapy. Vern lives west of Aylmer. He has 3 daughters: Marissa, Ainslie and Blaire. Vern enjoys spending time on his island in the Pickerel River near Port Loring. 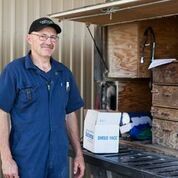 Dr. Russ Moncrief grew up on a farm in Huron County and graduated from the Ontario Veterinary College(OVC) in 1978. He practiced in Bruce County for 4 years before joining OVC classmate Dr. Vern Robertshaw in Aylmer in 1982. Dr. Russ has always practised large and small animal medicine, but more recently he has been spending his time in clinic working with our small animal patients. Russ lives on a small acreage near Mapleton in Elgin County with his wife Lesley, their 5 horses, dogs Toad and Badger, and a number of cats. They also have 2 adult children named Whitney and Scott. Dr. Russ has his pilot’s licence and in his spare time he enjoys traveling with family and friends. Dr. Wayne Caroll is a lifelong resident of Shedden, ON. He graduated from the Ontario Veterinary College in 1989 and later joined doctors Robertshaw and Moncrief in Aylmer. Dr. Carroll specializes in equine medicine. Wayne resides in Shedden with his wife Karen and their 4 children. Dr. Carroll along with his wife, own, raises and races Standardbred and Thoroughbred horses. Dr. Amanda Wiltsie Thoonen grew up in rural Elgin County and enjoyed caring for her family’s dogs, cats, horses and chickens. 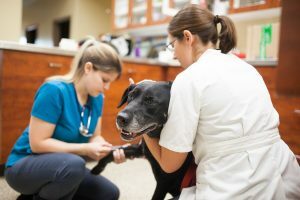 Upon graduation from the Ontario Veterinary College in 2006, she returned to her hometown to begin her veterinary career. Amanda joined the team at Imperial Road Animal Hospital in May of 2011 and works exclusively with small animals. 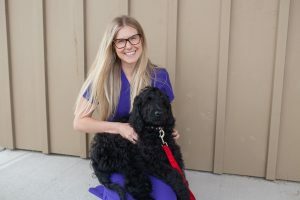 Although she enjoys most facets of small animal medicine and surgery, she is passionate about dental care as well as nutrition and loves the challenges that dermatology and endocrine diseases pose. Amanda lives outside Aylmer with her husband Leon, their busy 8 and 10 year old boys Gerritt and Drew, her Carin “terror” (Terrier) Scruffty, and cats Coal and Rocky. Amanda is a loud and proud hockey Mom and spends most of her spare time at the rink. Dr. Randi Font grew up in Oil Springs, ON and graduated from the Ontario Veterinary College in 2013. She worked as a mixed animal veterinarian in Sarnia before joining Imperial Road in December 2014. Dr. Font enjoys practicing on both small and large animals and has a passion for equine dentistry. She continues to strive to provide the best for her patients and has completed additional training in equine dentistry and both equine and small animal ultrasonography. In 2016, Dr. Randi pursued certification in Veterinary Spinal Manipulation Therapy and is now certified with the College of Animal Chiropractors. She currently lives outside of Aylmer with her husband Josh, and German Shepherd, Bo. In her spare time, she enjoys spending time at the barn and riding her horse. Dr. Rachael Needles grew up in Thorndale, ON on a hobby farm with donkeys, horses and ducks. She graduated from the Ontario Veterinary College in 2017 and completed a six month internship at Milton Equine Hospital prior to starting at Imperial Road Animal Hospital. Rachael is a large animal veterinarian with a special interest in equine and small ruminants. She is passionate about emergency medicine and helping our large animal friends whenever they need it. Rachael lives in Tillsonburg with her husband Deven, their Doberman/shepherd Lexi, two cats Sake and Keira and her Appaloosa/Arab horse Basil. In her spare time, she enjoys riding, dancing, and painting. A lifelong resident of Aylmer, Maria raised, trained and showed Arabian horses for 35 years. She began working for Dr. Robertshaw and Dr. Moncrief after graduation with honours from the animal laboratory technician program at Ridgetown College in 1986. 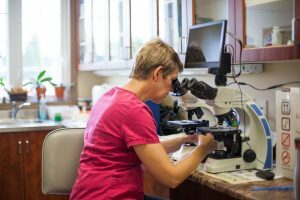 Over the years, Maria’s job at the clinic has evolved into an administrative role, but Maria can still be found behind gown, mask, cap and gloves as a surgical assistant and most frequently behind the microscope where she cannot hide her passion for cytology. Maria has 2 beautiful daughters. One is currently attending the University of Calgary obtaining a PHD in psychology oncology and one is hoping to enter law enforcement. Her furry family members include a dog, and 2 cats, but she has a special place in her heart for horses. The thing Maria most enjoys about her job is keeping all animals healthy and happy, including squirrels! 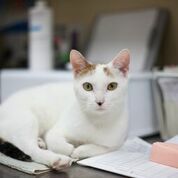 Candy joined the team at Imperial Road Animal Hospital in 2001 following her externship placement. She completed the veterinary medical receptionist program at Ridgetown College. Candy, her husband Jeremy, and her two handsome sons, Tristan, Hayden share their home with a beagle named Gracie, and a bulldog named Pixel. Marissa has been part of the team since she was a little girl. She can be found helping any of our doctors with large animal calls, or in the Shedden office. She lives just outside of Aylmer on the family farm. Marissa has numerous “fur children” who live with her. Melanie grew up on a hobby farm just outside of Alymer and cared for an array of pets, including cats, dogs, ferrets, birds, pigs, horses, and even a skunk. Mel graduated from Sheridan College in 2010 and came to work at Imperial Road shortly thereafter. Mel enjoys connecting with pets and their people. Mel lives locally with her husband Justin and son Griffin, and their dog Berkley. When she is not busy enjoying her growing family, Mel likes to read, work on home projects, and spend time outdoors. Kacey was born and raised in Aylmer, ON and graduated from Ridgetown College in 2013. She started at the clinic in February 2014. She enjoys all aspects of her job, but has a special interest in ultrasonography. She also assists our large animal veterinarians in clinic or on the road. She is one of our adoption coordinators for cats or kittens needing a home. Kacey enjoys spending time with her boyfriend, Mike, at the farm with his cattle, and reading. Lindsay joined the team in March 2016. She graduated from Georgian College’s veterinary technician program in Orillia, ON in 2009. 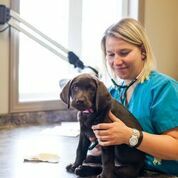 Over the years, she has worked at several small animal practises in Ontario and Alberta, in emergency medicine, and in the area of dental referral. She has a passion for dentistry, emergency medicine, and the Farley Foundation. Lindsay is certified in RECOVER CPR for animals. She lives in St. Thomas with her husband Codie, their 3 year old son William, and a beagle named Penny, a basset named Nora, a three legged cat, Hat Trick, and a cockatiel, Cuthbert. Amanda was born and raised in Caledon, ON before moving to London. Amanda graduated from Ridgetown’s veterinary office administration program in 2014 and began working for the clinic shortly after. Amanda currently lives in Lambeth with her fiancé Greg and their 2 goldendoodles Daphne, Bogey and their cat Rosie. When she isn’t greeting clients at our reception desk, Amanda enjoys teaching dance and hiking with her dogs. Bre joined the clinic in 2015 after completing her externship with us. Bre can also be found at our satellite clinic, Shedden Veterinary Clinic. She is a Ridgetown graduate of the veterinary office administration program. Bre is also one of our adoption coordinators for cats and kitten in the clinic that need homes. Bre currently lives in St. Thomas where she was born and raised. She has a chocolate lab name Bear, and two cats Lucas, and Larry. In her spare time she enjoys spending time with her boyfriend Sean, figure skating, and using her artistic talents creating wooden wall art. Cora was born and raised in St. Thomas, ON. Cora joined our team in April 2017. She has 2 dogs, Karma a Rhodesian Ridgeback, Stella an Aussie, and a throughbred named Ricochet. In her spare time Cora enjoys photographing at the Southwest horseshows and walks through Springwater.